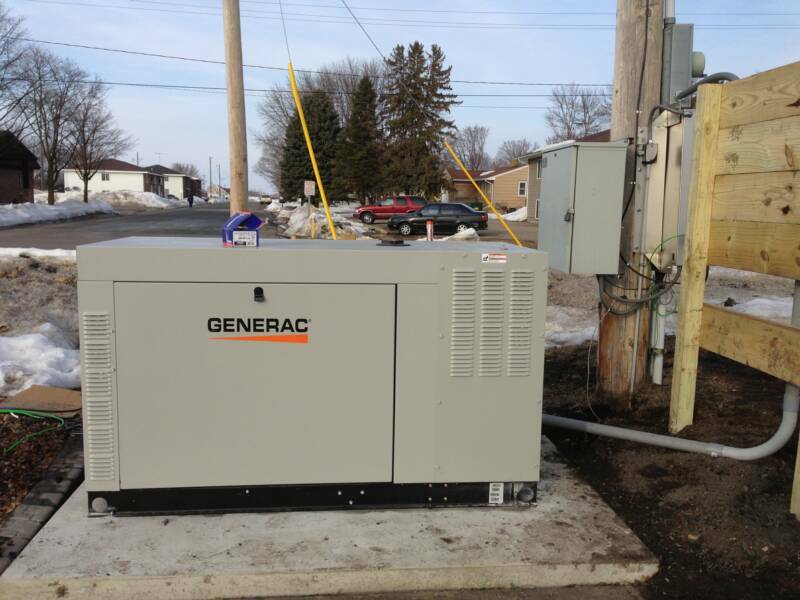 The new, fully automatic standby emergency generator now installed at the city's lift station is a natural gas powered Generac 30KW (kilowatt) three phase, electric start unit. 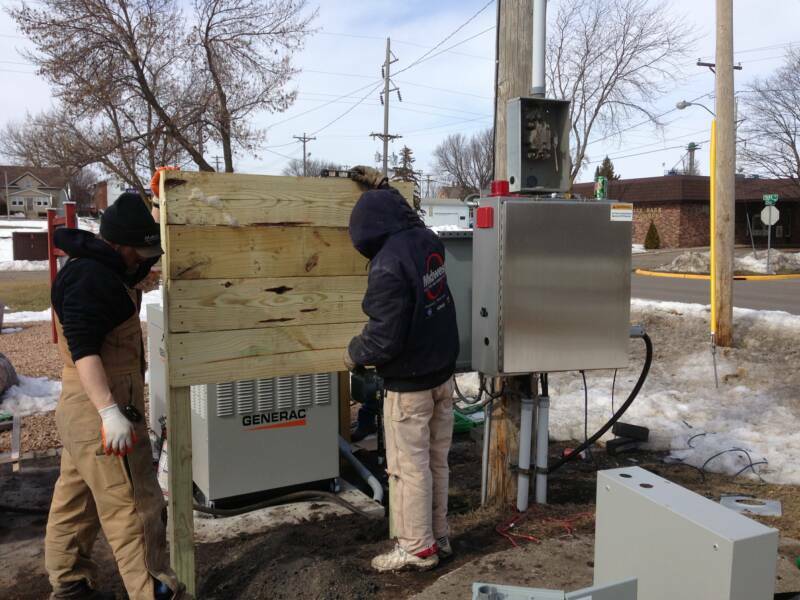 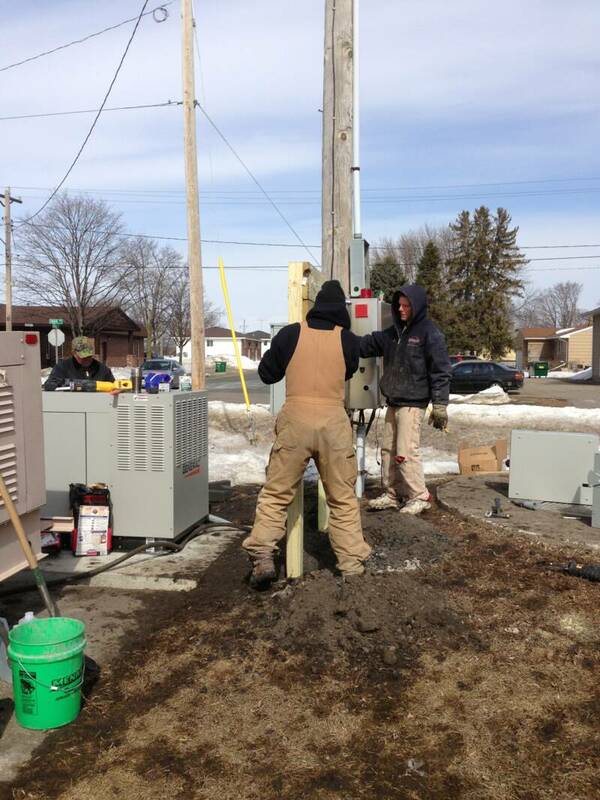 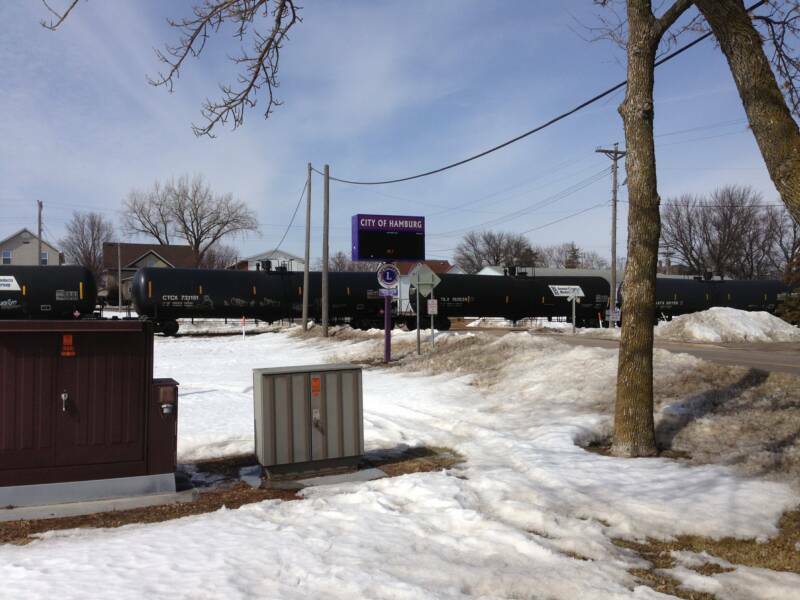 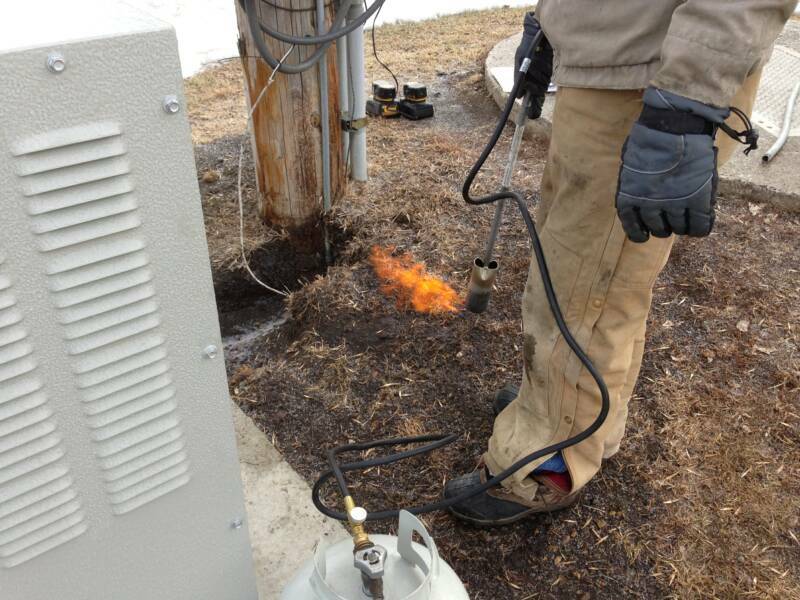 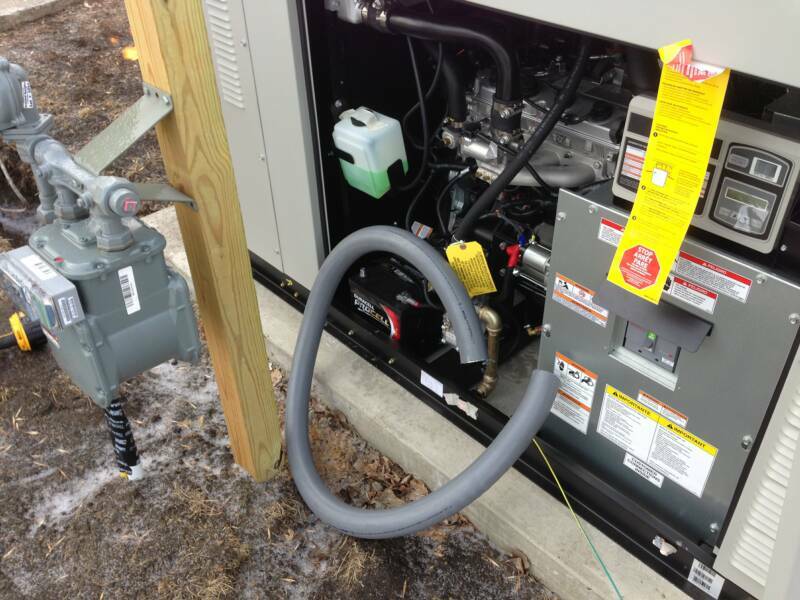 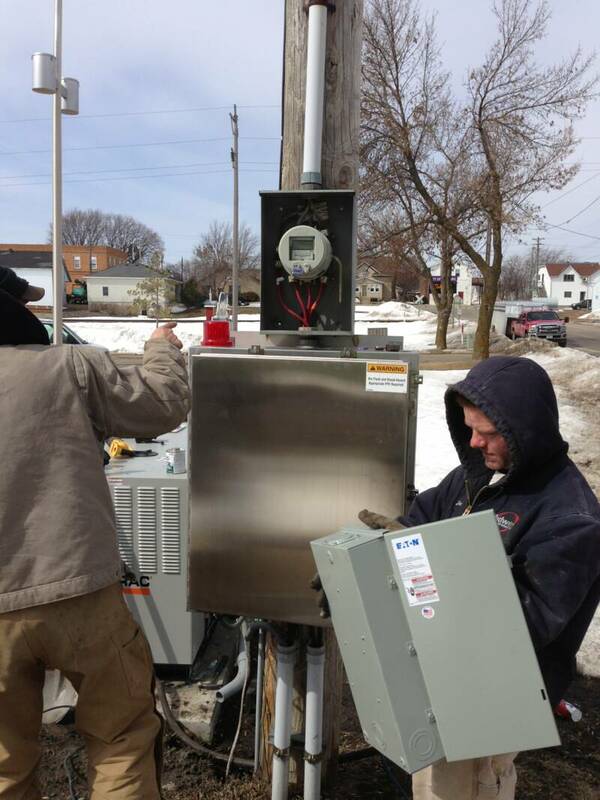 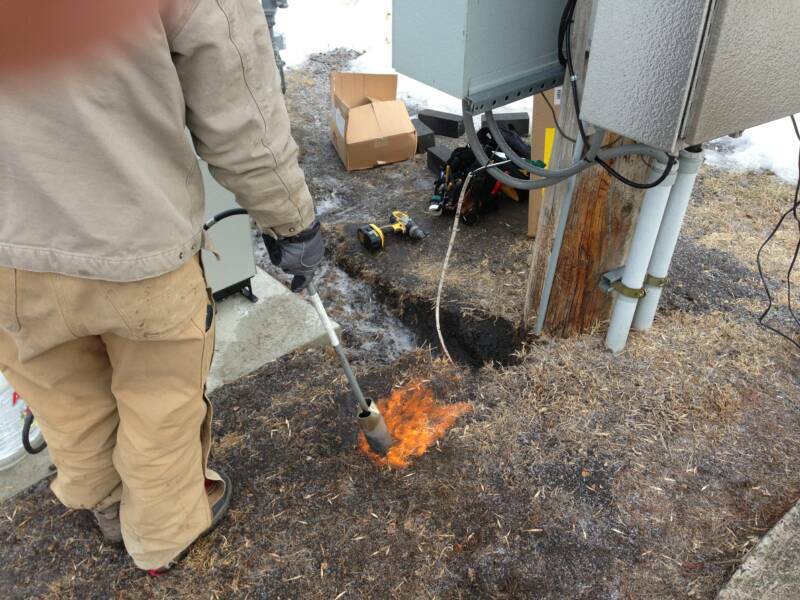 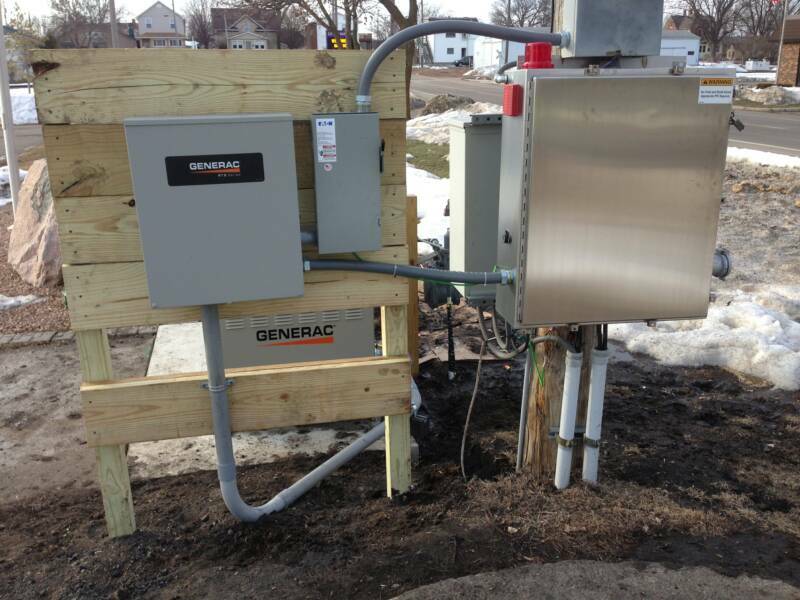 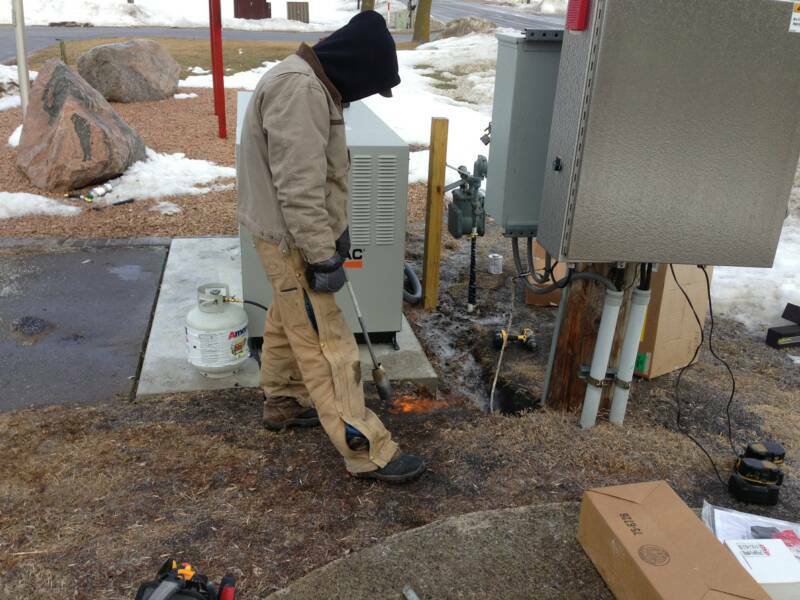 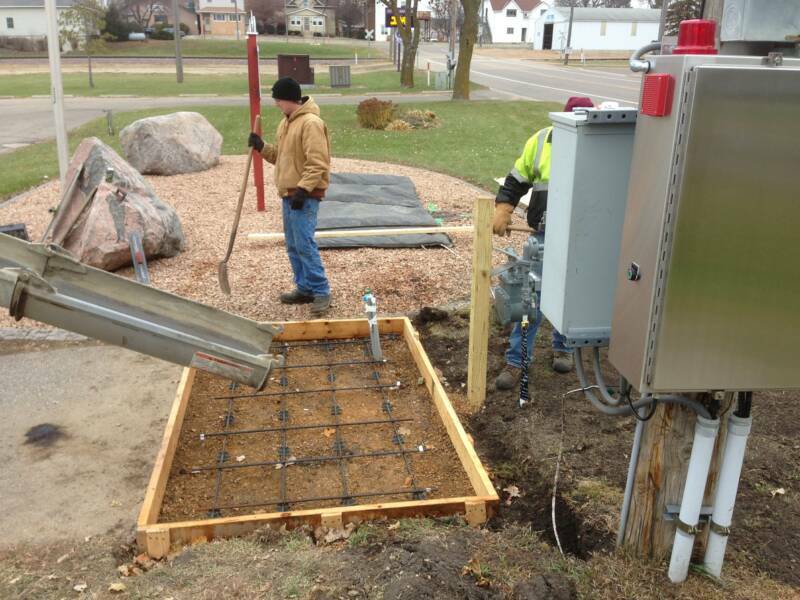 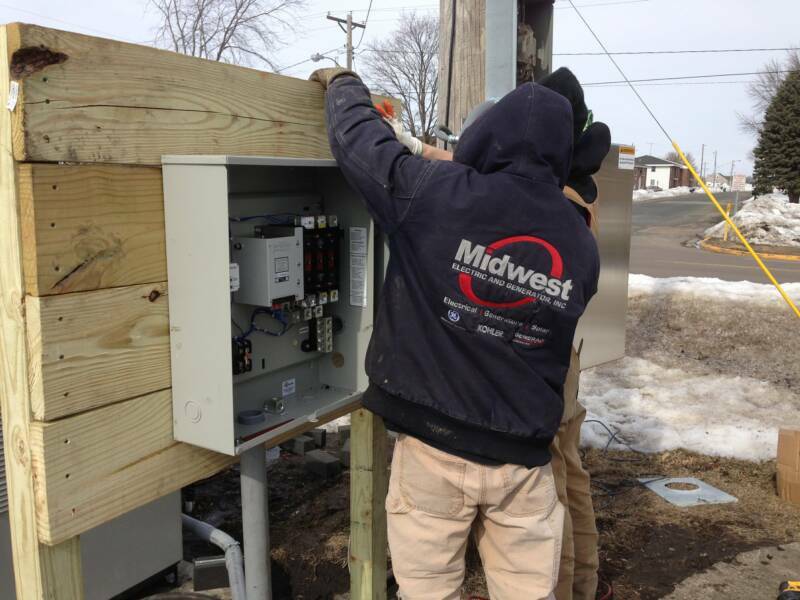 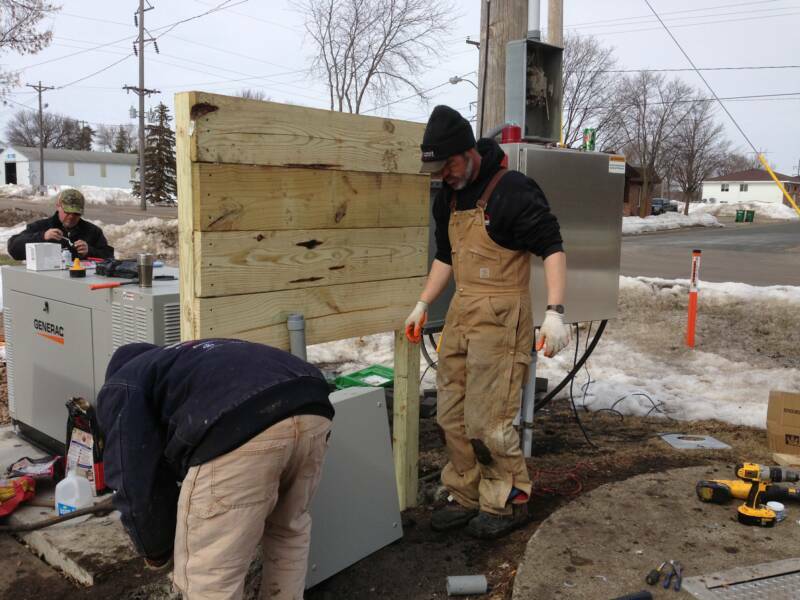 Within approximately ten seconds of commercial power (Xcel Energy) being lost, the new automatic standby generator starts and begins powering the lift station control panels and associated lift station pumps. 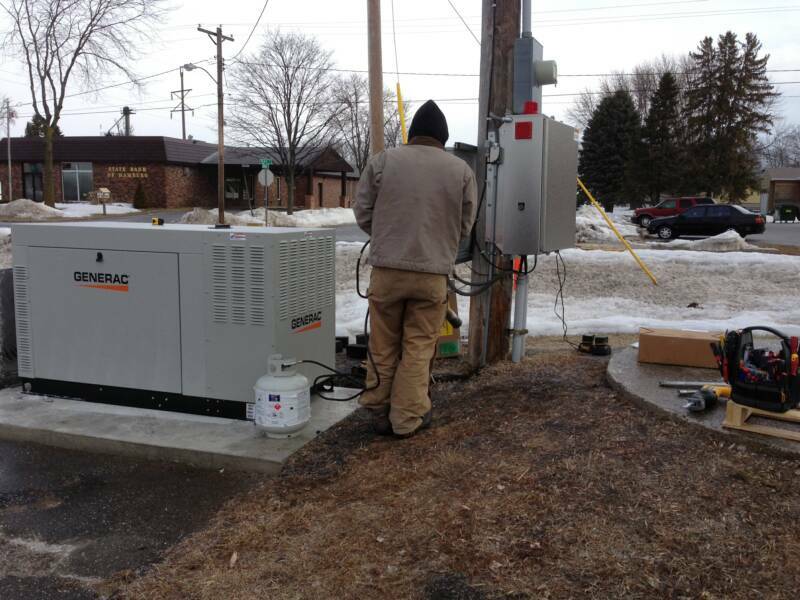 Because it is powered by natural gas, the unit could conceivably run continuously for hours, days; perhaps weeks; maybe even months. 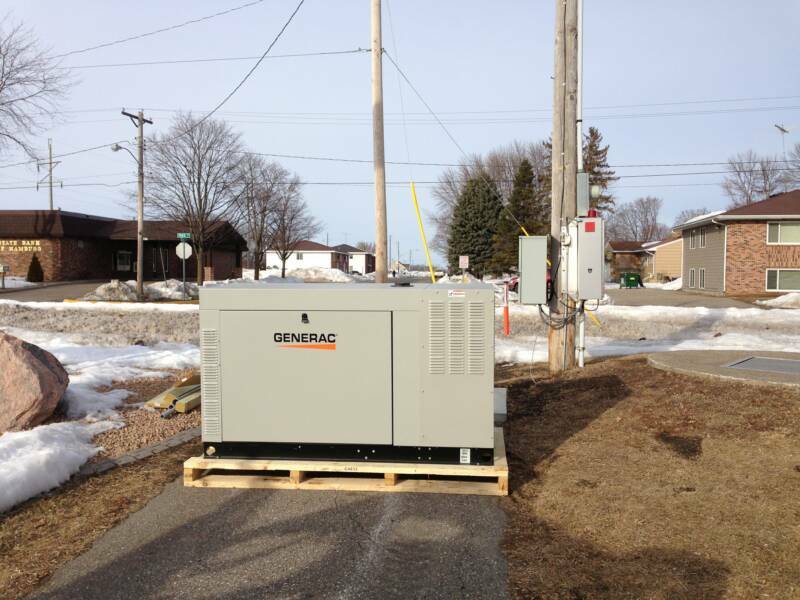 When commercial power is restored, the unit begins a 'cool down' period and then automatically shuts down; ready for the next power outage to occur. 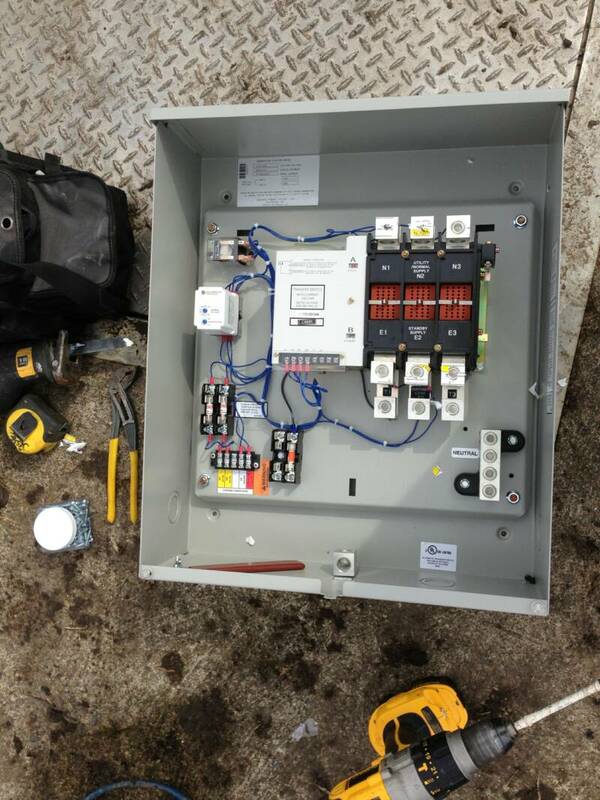 The 'electronics' of the combined engine/generator unit monitor various conditions within the engine and generator such as low oil pressure, high operating temperature, low backup battery, failure to start and other abnormal conditions. 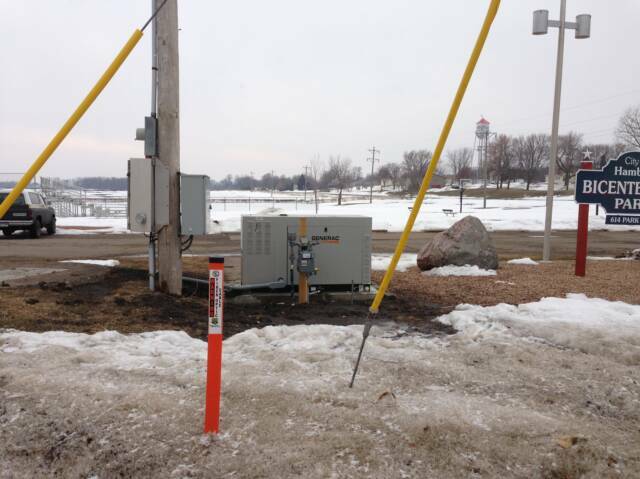 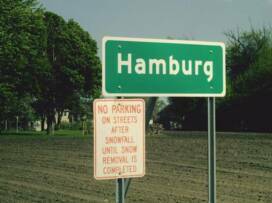 Should any of these abnormal conditions occur, an alarm signal will be instantly sent to company that monitors the lift station and Water Treatment Plant alarm condition monitoring equipment and city staff will be notified. 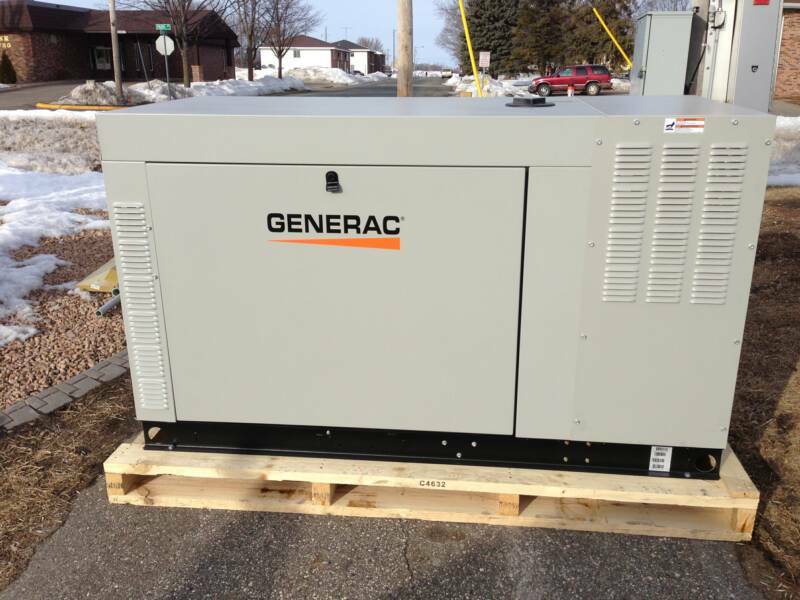 The generator automatically 'self tests' once a week by starting itself and running for approximately twelve minutes. 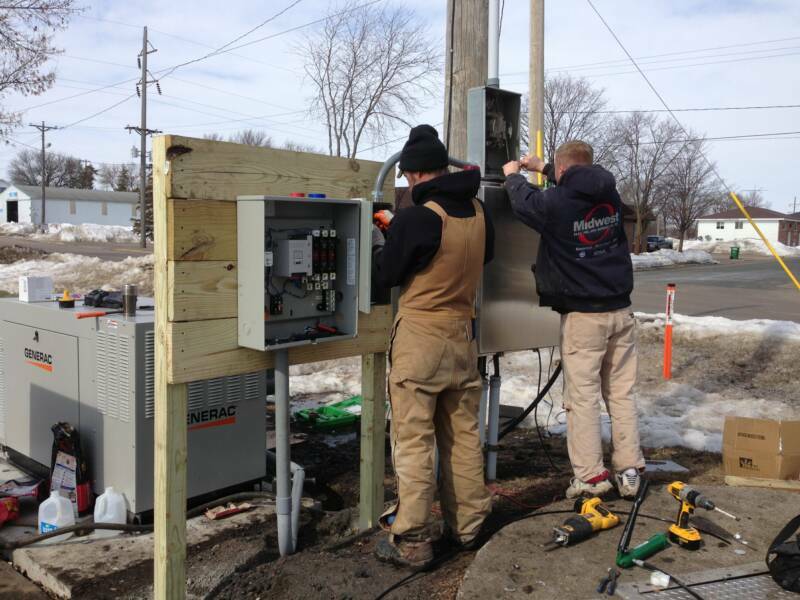 Periodically, city staff will simulate a commercial power outage to ensure 'fail-safe' operation in the event of a power failure to the lift station. 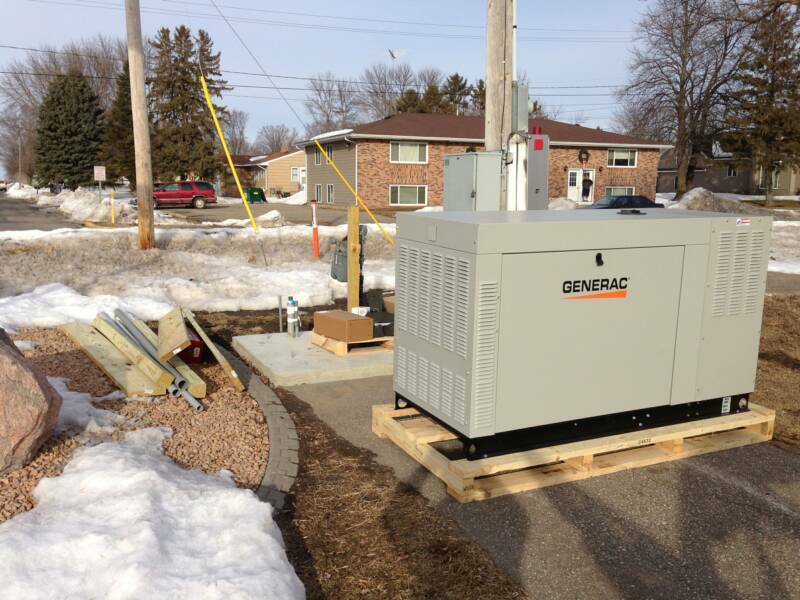 Hamburg residents will notice an huge reduction in 'noise' with this new generator while it is 'running' as compared to the old, diesel powered portable generator that had to be manually connected to the control panel of the lift station in the event of a commercial power failure, manually started and then 'monitored' throughout the duration of the power outage. 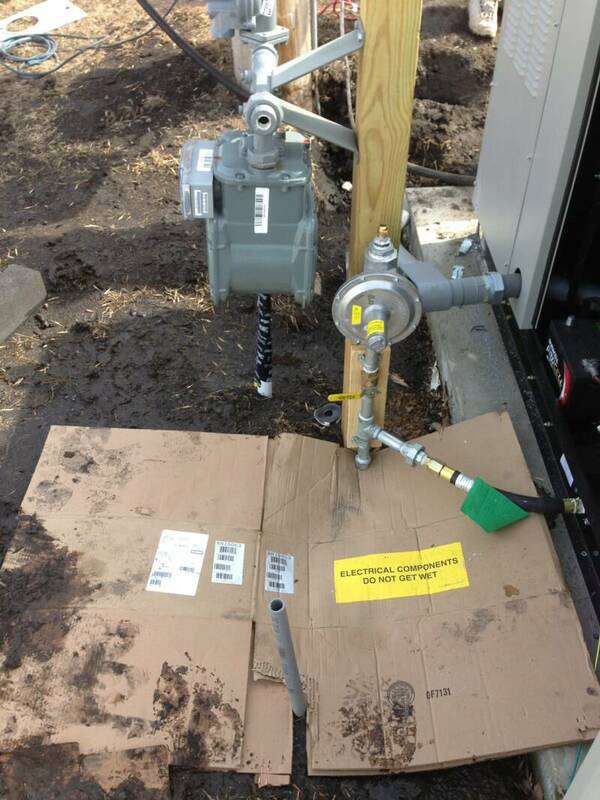 Everything now is 'automatic' and no one needs to be in attendance before, during or after a power failure affecting the lift station. 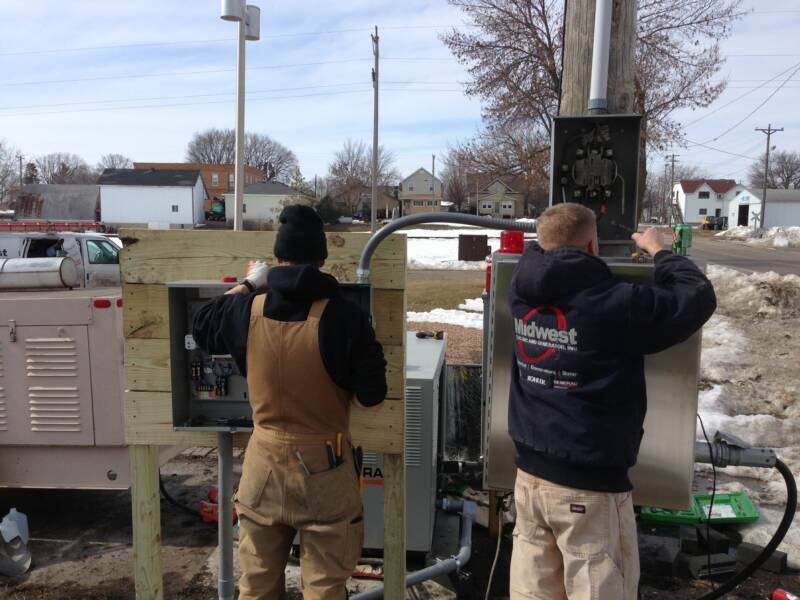 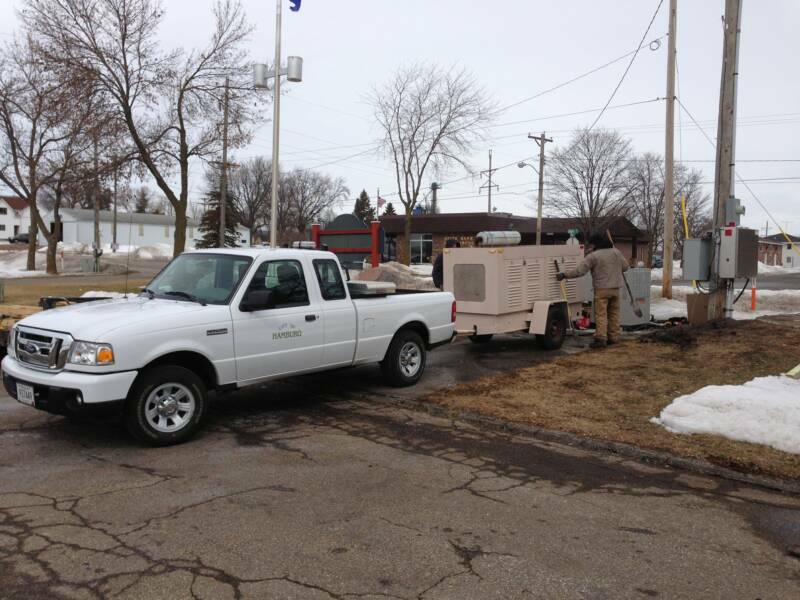 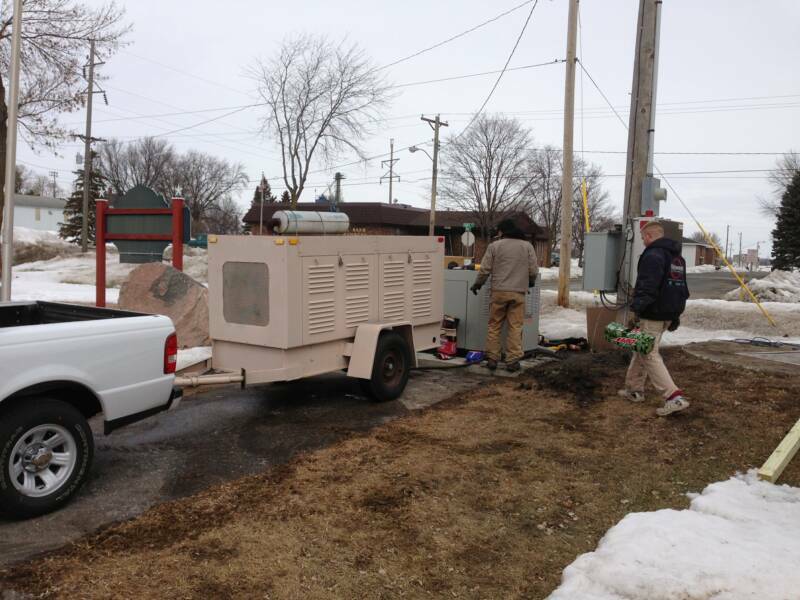 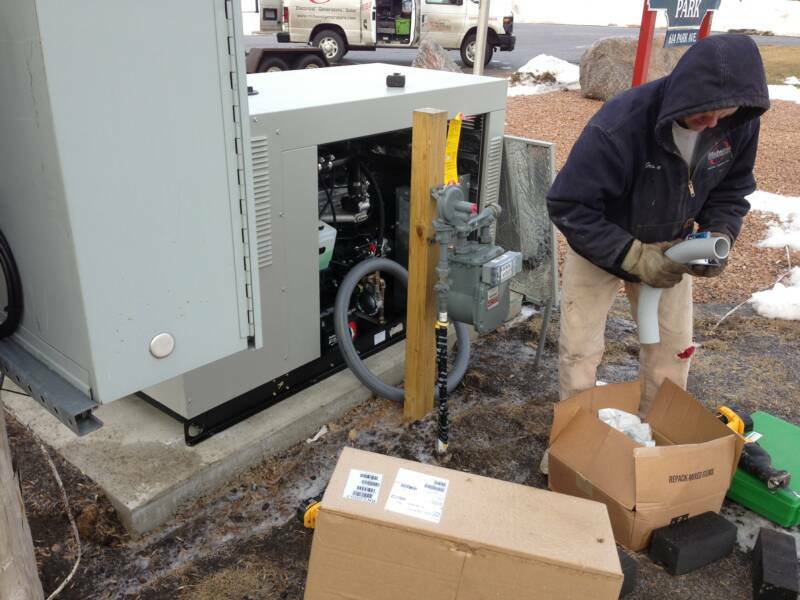 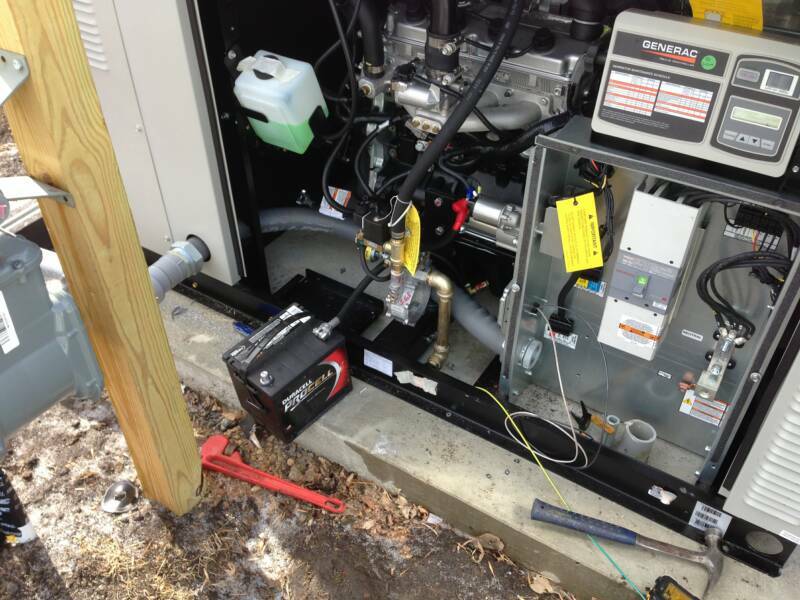 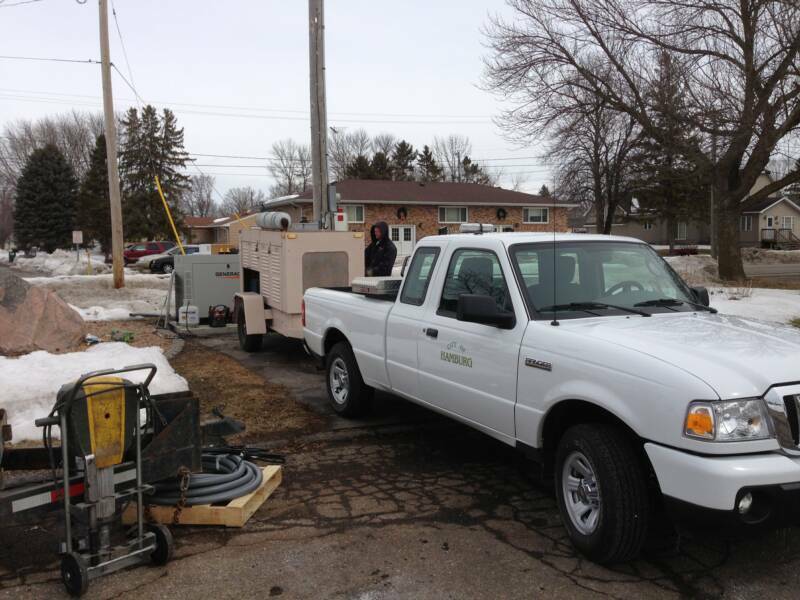 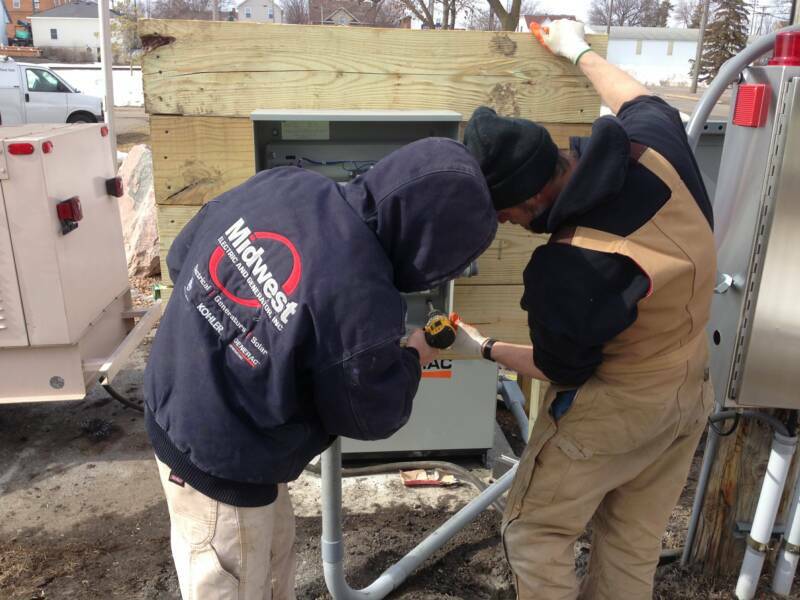 The following pictures document the installation progress of the new standby generator for the city's lift station. 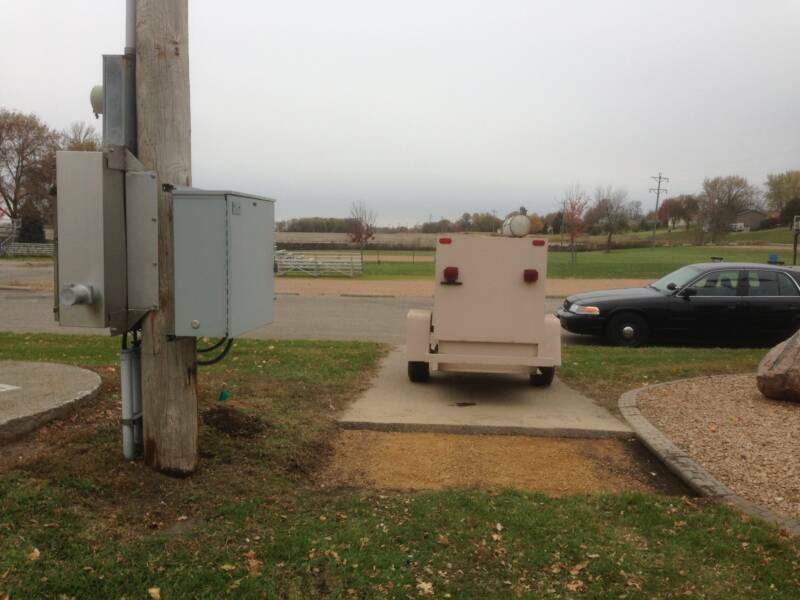 Click on the image you want to view to 'enlarge' it. 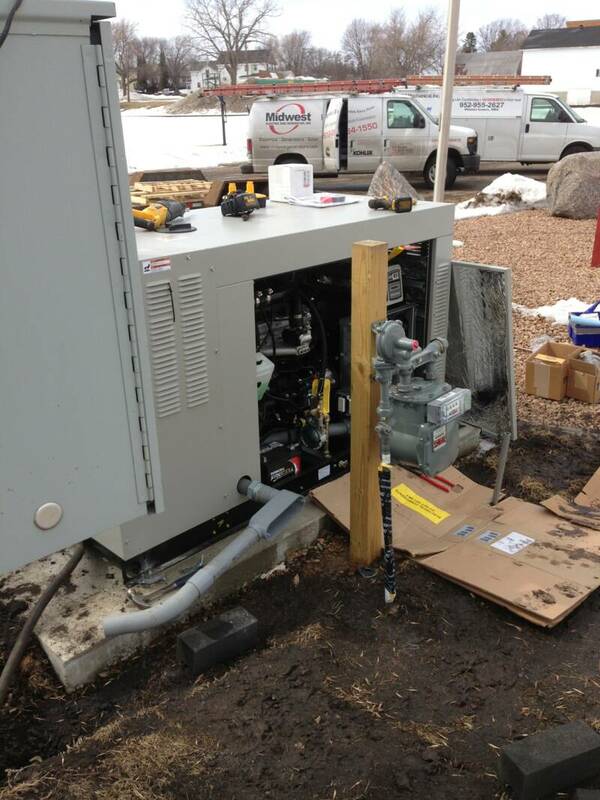 The picture at the right shows the final generator installation. 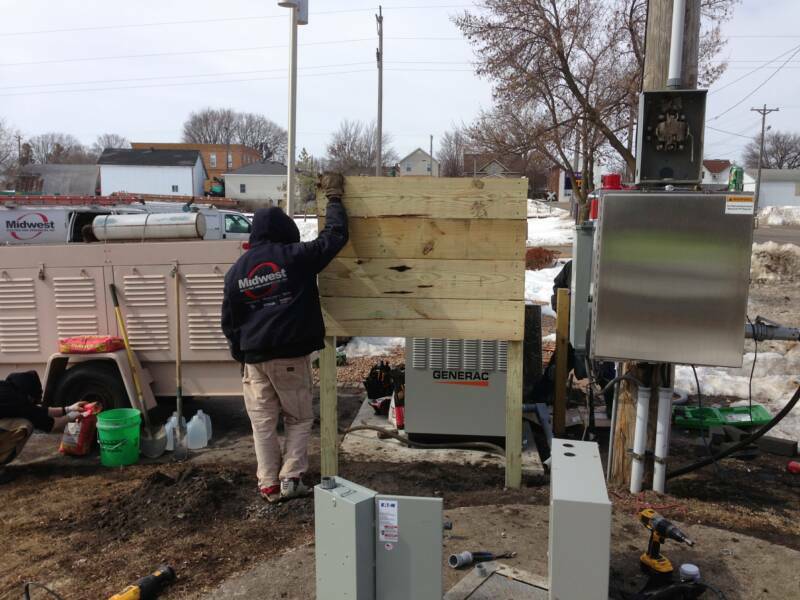 It is anticipated that the gas meter and generator will possibly be obscured by a white fence of some (undetermined) kind this spring and the conduit from the generator to the transfer switch will be buried after the ground thaws out to keep the area esthetically pleasing. 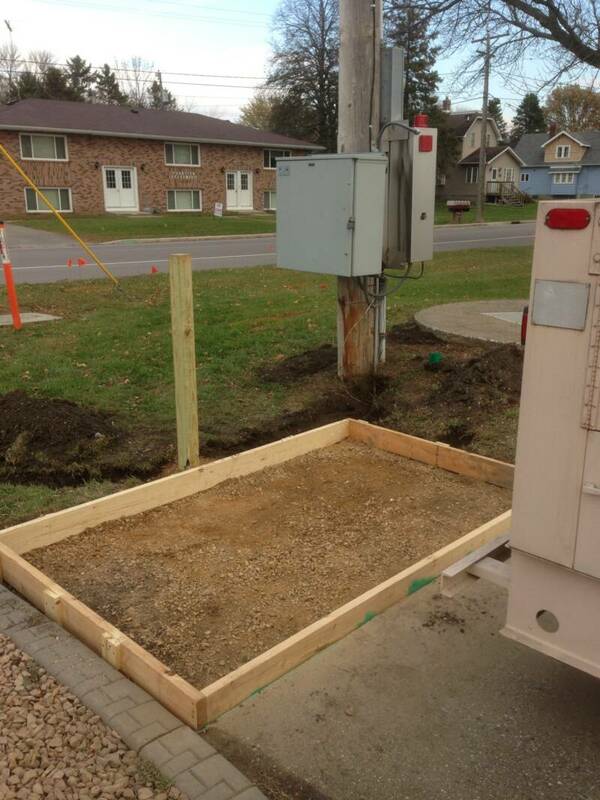 Also the areas of bare dirt will be leveled off and grass seed planted or sod put in place. 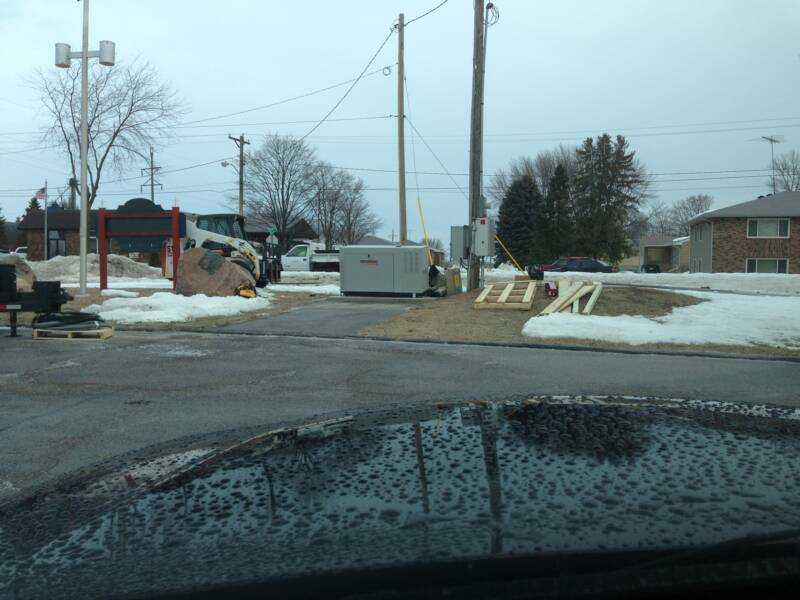 In so doing, the area will be pretty much be 'back to normal' as far as appearance is concerned. 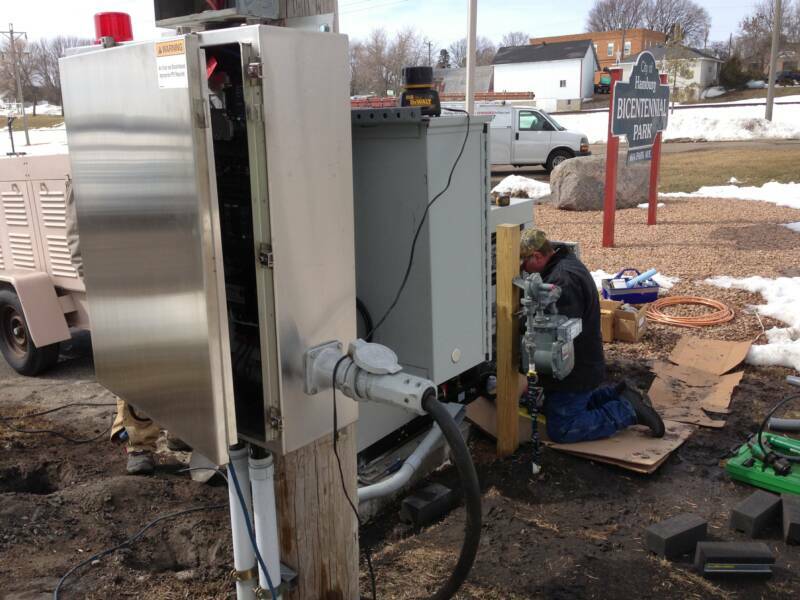 And, yes; the light on the flag poll behind the BICENTENNIAL PARK sign will be reconnected. 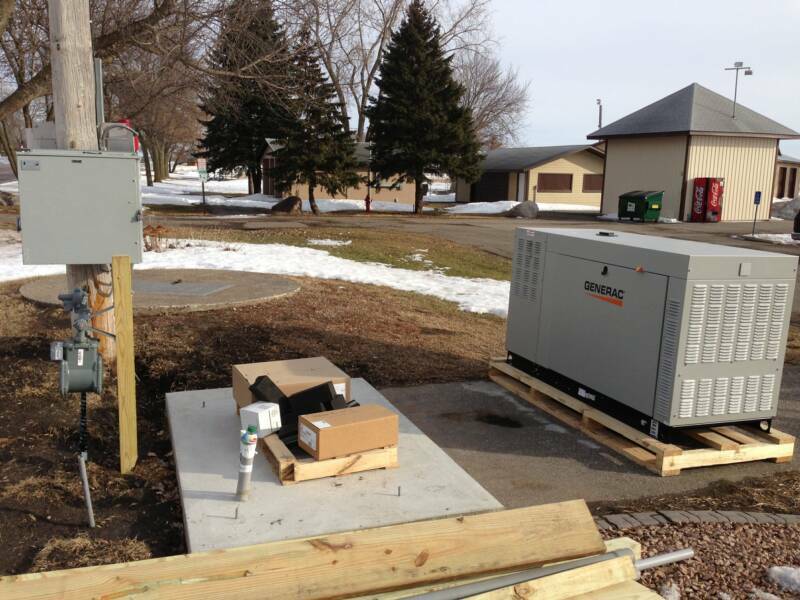 The picture to the left shows the new generator site as it was prepared last fall in anticipation of the installation of the new, fully automatic lift station standby generator. 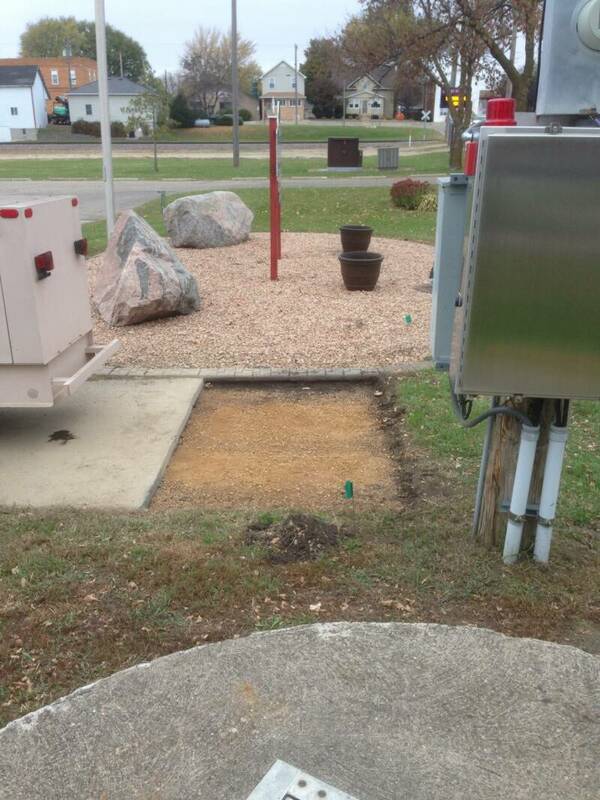 In a few months, the whole area will be looking again as it originally did. 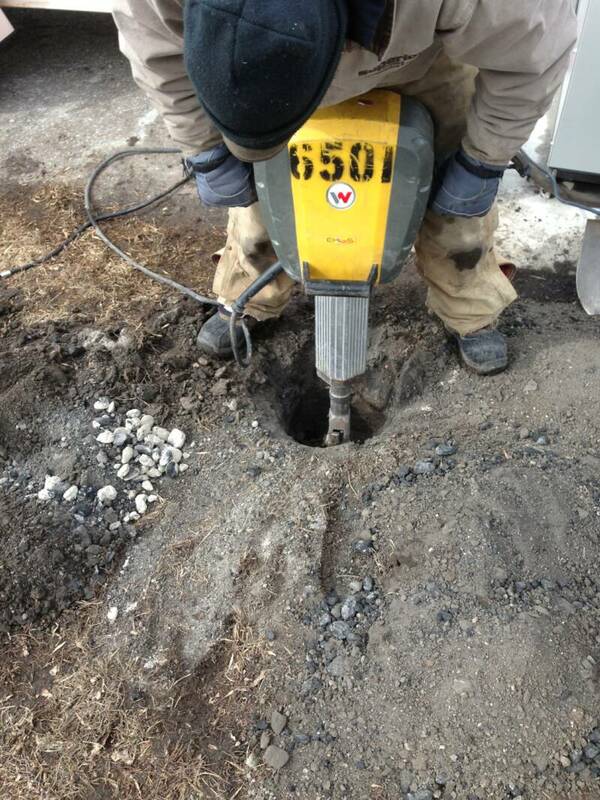 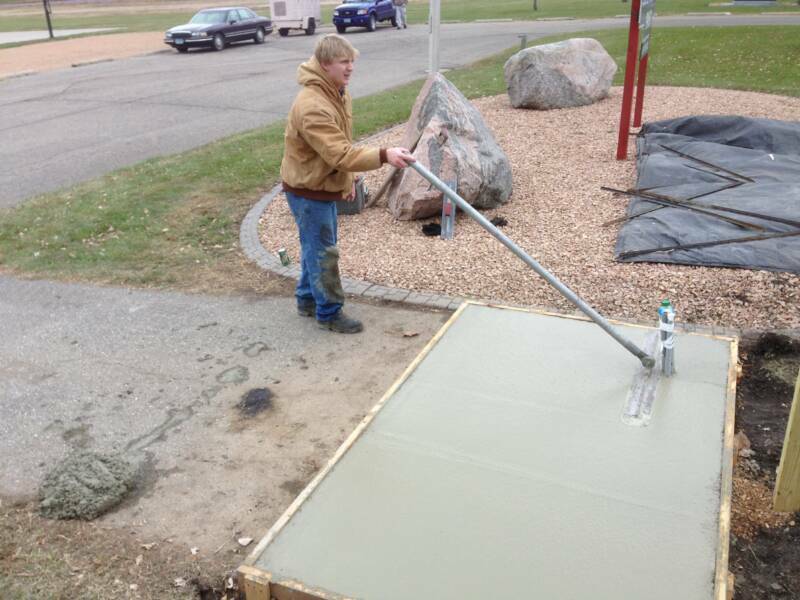 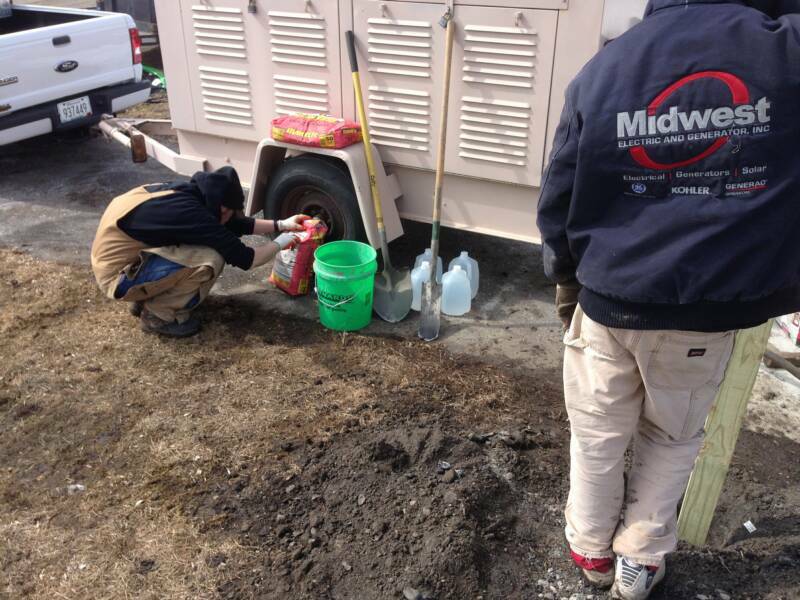 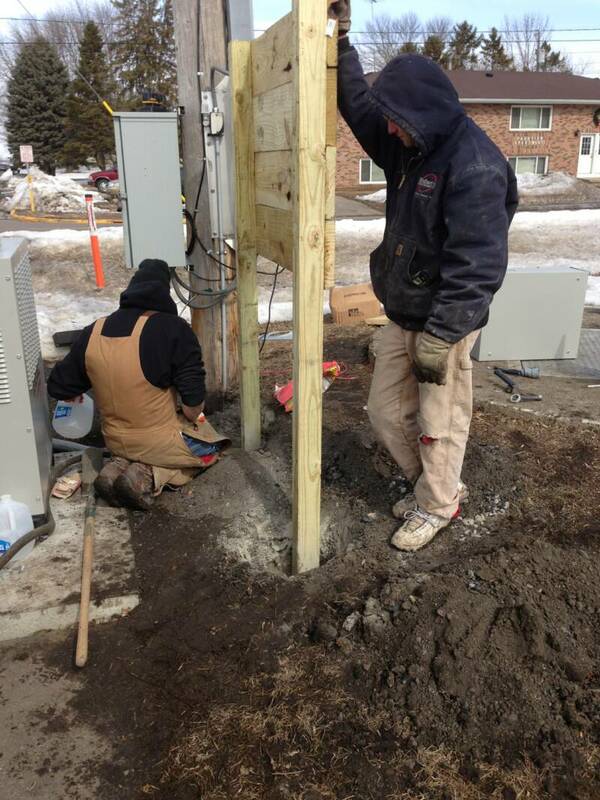 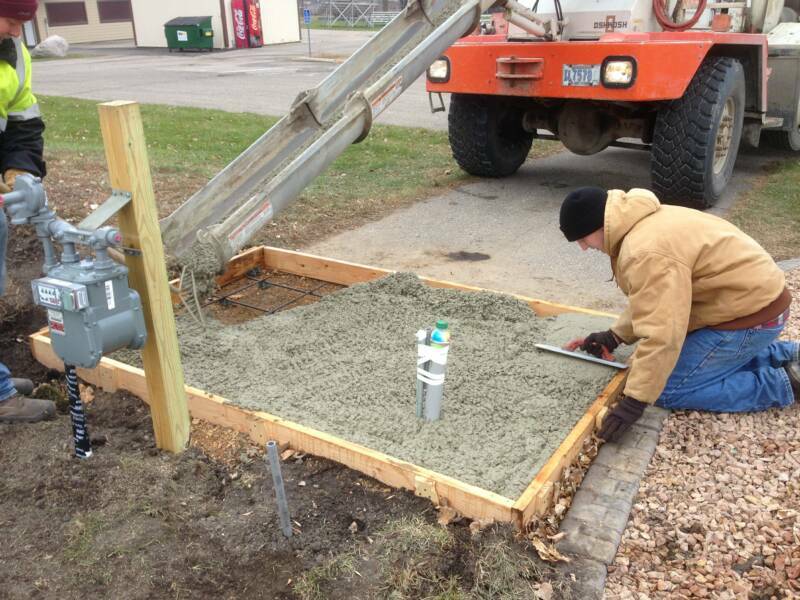 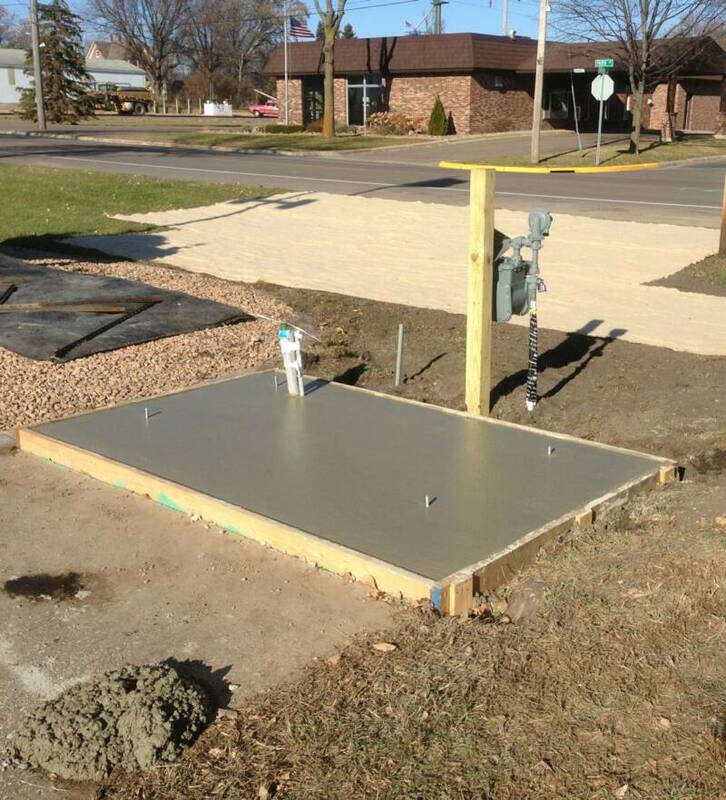 Kyle Trebesch help greatly with preparing the cement slab on which the emergency generator would eventually rest. 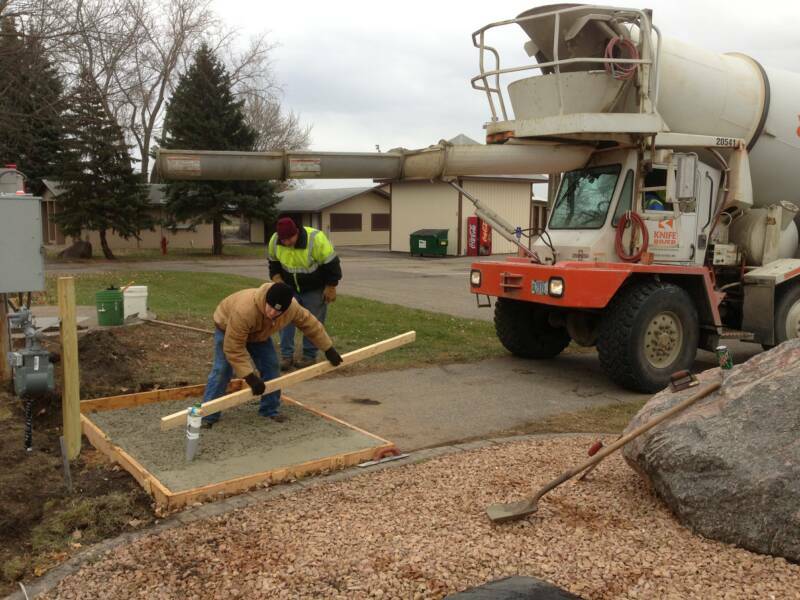 Once the slab was 'troweled out', an insulating tarp was used to cover the slab over the winter months.